Prop Ryan Grant says Glasgow Warriors "need" to beat Munster in Friday's Pro12 play-off semi-final, having built towards this moment for three years. Warriors' 54-0 win over Zebre on Saturday secured a first home semi-final for a Scottish side. "We have made history, but that's not enough," said Grant. "We want to win it and we need to win it. "It's three years we've been building towards this. Everything is in place, it's our task to get the job done." 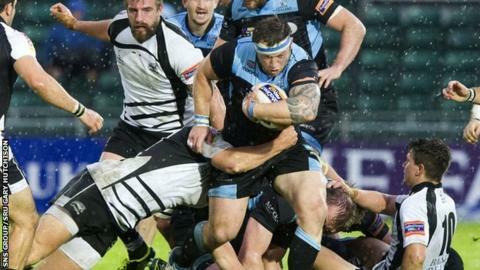 Glasgow blew Zebre away at Scotstoun, scoring four tries in the first 20 minutes, including one with their first possession. And Grant believes home advantage could be the key factor against Munster as the Warriors look to reach their first Pro12 final. "It's huge, we've been in the semi-finals twice and it's tough playing away from home, but you can hear the crowd and they've been tremendous for us in the last few weeks," he added. "We have every chance of making the final. We've had a long history of aggressive battles against Munster and this one will be no different, the boys love it and will look forward to it. "We knew we had a job to do against Zebre, and what was on the line. All the boys wanted it and we are all playing for our spot next week." Warriors scored two tries in a rain-soaked second half against the Italians. And head coach Gregor Townsend was just as impressed with his side preventing Zebre from scoring as he was with their efforts in attack. "The big thing was keeping that zero in the second half, keeping our defence in place," he said. "There was a lot of mistakes in the second half in tough conditions, but we got better and better and in the last 15 minutes we played better tactically and put them under pressure with our kicking game. "To score a try off your first bit of possession is something I don't think we've done all season. It was an excellent start and probably put doubt in Zebre's minds. They knew we were at 100% straight away." Warriors beat Munster 22-5 at Thomond Park last month, and Townsend is already planning his approach to Friday's match. He said: "We've got to make sure we pick a side that puts us in the best position for winning that game, but I could pick any number of players, from 30 to 35 players. We'll have a strong team no matter what. "It's the first time the club have a home semi-final so it would be great if it was full of Glasgow supporters next week."